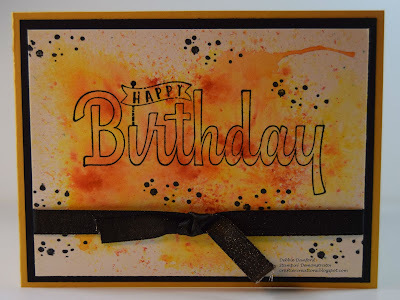 Craftier Creations: Brusho Happy Birthday and It's Sale-a-Bration Time! Brusho Happy Birthday and It's Sale-a-Bration Time! Happy New Year. I hope everyone enjoyed the holiday season. Here we are into 2018. Can you believe it. Our first grandchild is due in a few weeks and 😀 we are so excited. With a new year always comes all the resolutions everyone makes. I personally don't like to do that, because I feel I am just setting myself up for failure. If you are one that does do that, I wish you all the luck! Although it's not a resolution, I do plan on getting better about posting. I know I have said this before, but, kudos to all those demonstrators or carfter's that post everyday. I know it takes a lot of time and effort. 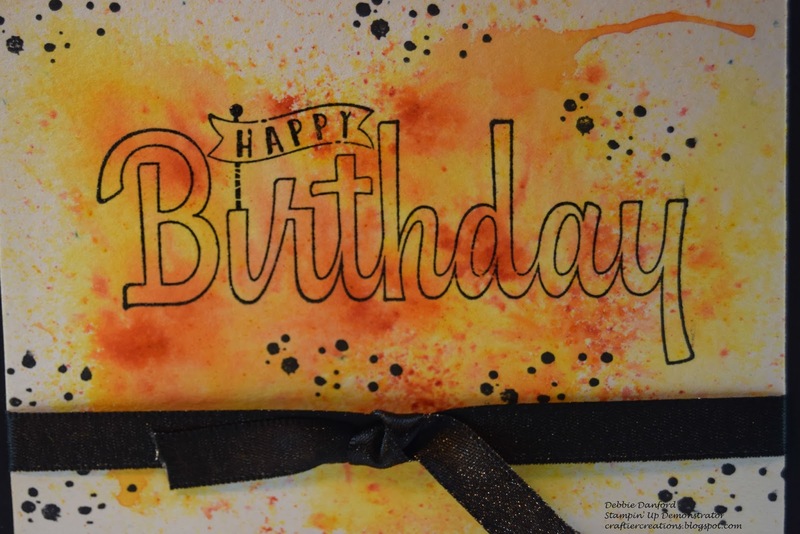 Before I tell you about today's project I want to let you know that the Occasions and Sale-a-Bration catalogs are live. Sale-a-Bration runs through March 31st, and Occasions runs through May 31st. If you don't have a catalog, you have several ways to get one. 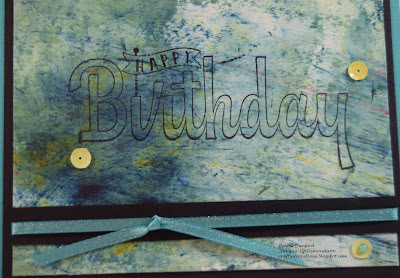 You can sign up for the Stampin' Palooza, details here, and you will receive a free copy. Or, shoot me an e-mail and we can make arrangements for you to get a copy. On to today's project. We have a new product in the Occasions catalog, it's called Brusho. I am loving it. 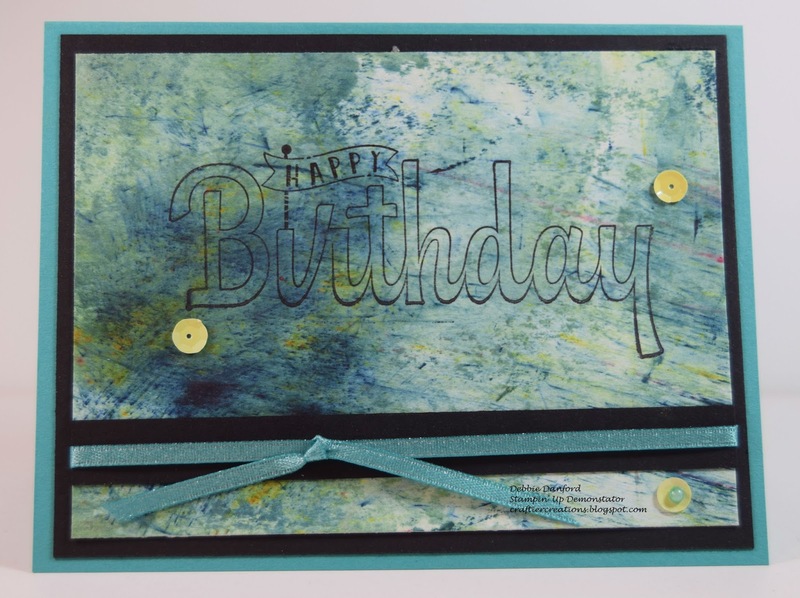 Today I am going to share a couple quick cards I made using Brusho. I have some many ideas of other things to try with this product. But, for today I kept it very simple. Brusho is a very fine powder, and when mixed with a liquid it blends all the powders together. When you get your Brusho you don't need to pull the tab and open the bottle, just use a push pin to punch a hole in the top. A little goes a long way with this powder. I used the yellow and the Gamboge which is an orange color. 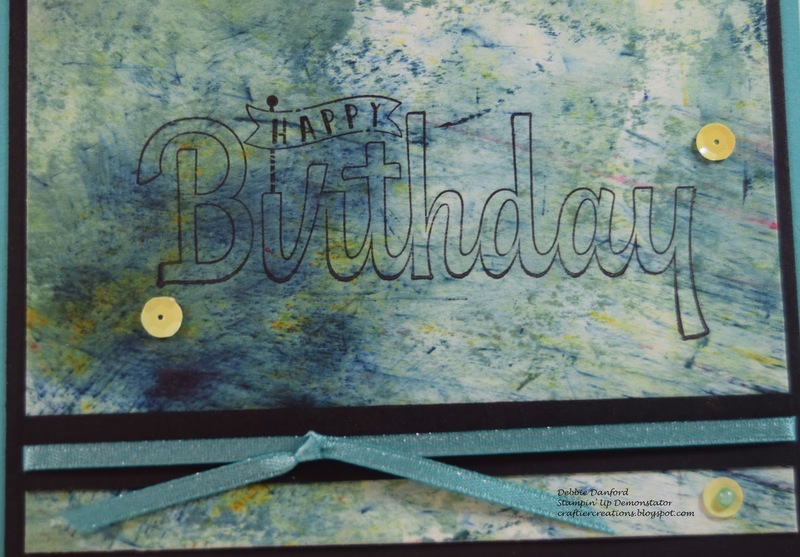 Sprinkle the powders on the Water Color paper and spritz with water. You will see when the powder hits the water it all starts to blend together. If you don't think it's dark enough, you can add more powder. Set aside to dry, or dry with a heat gun. 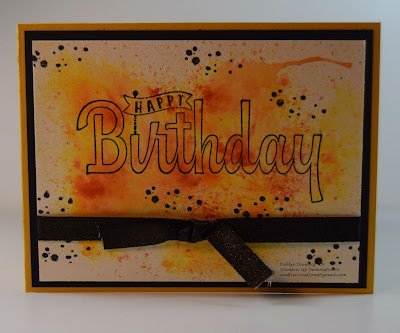 After it is dry stamp with Memento Black Ink and emboss with clear embossing powder. Randomly stamp the ink splotches with Black Ink. Attach Ribbon and layer onto Basic Black then Crushed Curry. The one was also done on Water Color paper using the Prussian Blue, Moss Green and a little bit of the Yellow. Be careful with the blue it can get very dark. A little goes a long way! Stamp Happy Birthday with Basic Black then, I added a 1/2" strip of Basic Black paper and Bermuda Bay ribbon on top. (it is free with a $50.00 purchase in the Sale-a-Bration Catalog). 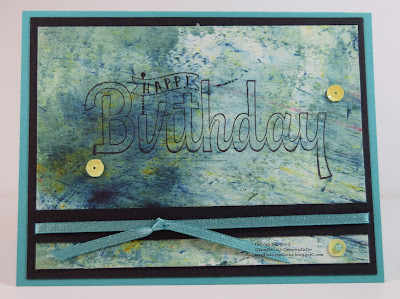 The bling is the new Adhesive Sequins and a pearl colored with the Bermuda Bay Stampin' Blends. Layer on top of Basic black and Bermuda Bay.